“She is a mellow, sweet thing,” say the Rabbit Advocates of Xenobia. They also say she had a rough start. Xenobia was dumped on an RA volunteer, her coat filthy with urine, very fearful . . . and pregnant. Since being in loving hands her fur has grown out to a stunning white and she excels at exploring and locating perfect sitting spots. She now loves having her face rubbed and isn’t shy about feeding time. 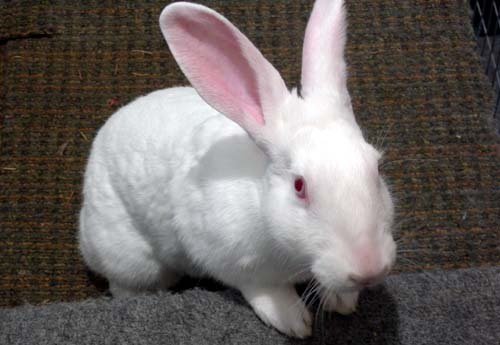 Her friends think she is about two years old and they’re seeking a dedicated bunny-friendly home for this lovely girl. Please contact ZenaRabbit@inbox.com or 503-788-7676 to meet Xenobia.